Lately, I've been getting quite a few remarks on my photographs which both flatter me and make me laugh. I'm not a photographer. Up until last July, all of the photographs on my blog were shot with my Canon Elph Point & Shoot. When I finally invested in an SLR camera, the quality of my photos increased partially due to me and partially due to the camera itself. I always admired those who had beautiful photographs yet I didn't put a lot of time into taking photographs myself. My small point & shoot camera was almost always in my purse yet I rarely took it out and used it. Most of the time I forgot it was even there. If we were doing something I deemed 'special,' I'd make more of an effort to take photos but it certainly wasn't a priority. The thing about an SLR camera is that you never forget it's there. It is bulky and heavy so whether it's on my shoulder or in my purse, I remember that I have it and if I'm going to be lugging it around, I'm going to use it. The more I used it, the better I became at framing photos and using different angles. I started to learn what worked well and what didn't and for the first half of the year, I didn't edit any photos which I think really helped me work on my actual photo taking ability. Now, I still don't deem myself a photographer mostly because these days, I'm rarely moving it off Automatic. Learning how to use a camera in Manual mode is a lot of work and can be frustrating (I equate it to golf. You might take 60 terrible shots for every great one.) It's a goal of mine to redo my Photography Tutorial (as seen below) and to get out and practice. Even so, I'm particularly pleased with how far my photographs have come in the last year. My first foray into SLR photography warranted a beginner SLR camera and the Rebel series is perfect. I've been really happy with the quality of photos I've been getting and while the kit lens is not particularly impressive, it does the trick. A birthday gift from Joe, this lens has been fantastic for scenery pictures which is what I've been doing a lot of lately in Norway. Having already picked out a more expensive Canon version, the technician in store talked us into the less expensive Sigma lens instead and I have no complaints thus far. Upon purchasing Lightroom, I needed some help. I had already whittled away one free trial because it was difficult to learn on my own and I wasn't going to waste any more time with it sitting on my desktop not in use. This tutorial is fantastic! It has given me the basics as well as a lot of tips and tricks that I might never have figured out on my own. I find myself going back to certain videos for refreshers or if I want to try something new. Best. Purchase. Ever. Also new to me, the Bowery bag is gorgeous. Pre-second lens, my camera was slung on my shoulder or in my regular purse and that wasn't going to work when I acquired the wide angle lens. This bag is pretty small when my camera & second lens are inside but it's be perfect for easy traveling and it looks nothing like a camera bag which, in my opinion, is a good thing. When I bought my SLR last summer, I immediately purchased this tutorial. It was really great to work through yet I didn't follow through with the practising. My goal is to re-do it and get back on Manual. Up until March of this year, the vast majority of my photos were unedited or through PicMonkey but I wanted to step it up and have a few more options at my disposal. Lightroom has been perfect for my photo editing needs. It's really well priced for semi-professional software and after learning how to use it, I feel like I can quickly enhance my photos either for the blog or for my own personal use. While Lightroom is great for editing photos, I use the free version of PicMonkey for adding text or making collages. Sometimes, I buy a month of the premium version if I'm working on something specific and need the extra options but, once I've finished, I cancel the payments and save the monthly fee. 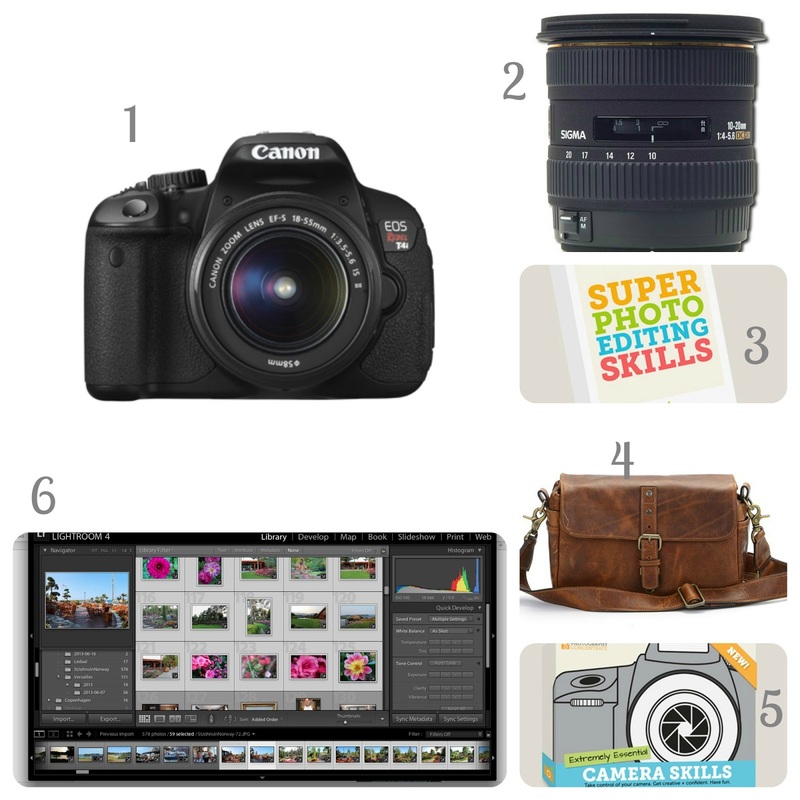 There you have it - my photography essentials. I still have so much to learn but I think that's what makes it a great hobby. Do you have any go-to photography products to recommend? all the fuss over how hard it is to use your camera in manual makes me wonder if there's something big that I'm missing? some aspect of manual of whose existence I'm unaware? I used the automatic settings on my SLR for the first few months just because I didn't really know there WAS a manual mode, but once I started trying I picked things up pretty quickly. it's just about balancing ISO, aperture, and shutter speed, so I feel like once you know how to control and adjust those settings everything falls into place. I really enjoyed this round-up- pinning it so I don't forget! I'm trying to learn more and more about photography for my blog and this really helped, thanks! Glad it was helpful, Kayli! Oh yes I love Lightroom. I do not know what I would do without it because it simplifies my life by putting my meta data in with my copyright and easy to fix quick things in pinch. I'm really glad you mentioned that tutorial package for Lightroom. I've been thinking about getting Lightroom because my version of Photoshop Elements is so outdated, but I was scared to learn a new program. This looks like it makes it easier! Your camera bag is gorgeous, by the way! Awesome essentials. I almost never take my 35mm off of my camera. I also just started using a crumpler strap and leave my camera bag at home. Oooh LOVE the Bowery bag!